Our placenta, in a drinkable liquid form, provides a number of benefits through its high nutrient density and large amounts of viable collagen. Collagen is a complex protein that is the main component of connective tissues; it provides structure, elasticity and protection, while helping to retain moisture within the deep dermal layers of the skin. Collagen naturally decreases over time as we age, causing skin to become thinner, drier, and more fragile. Loss of collagen is believed to be the primary cause of fine lines and wrinkles. 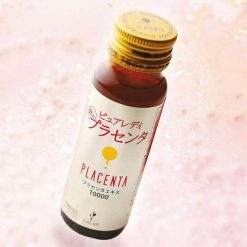 Placenta offers the body an immediate supply of essential vitamins and nutrients, and collagen derived from this source gives skin strength and elasticity, triggering the body to quickly heal wounds. This placenta drink comes in easy-to-drink 25ml bottles. Each drink is naturally fruit-flavored and contains Goji berry extract for added antioxidant benefits. As the placent is in liquid form, the nutrients can be readily absorbed and rapidly utilized by the body. 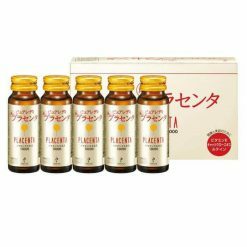 This product contains placenta extract (from pigs), lemon juice, refined honey, orange juice, black vinegar, raw royal jelly, goji berry, ginseng, lactobacillus, cat’s claw extract, trehalose, spices, pectin, vitamin E, marigold pigment (contains lutein).